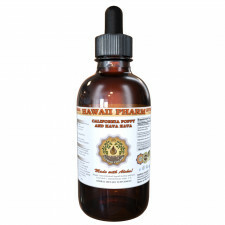 Hawaii Pharm Body Cleanse Pet Supplement contains no GMO, gluten, heavy metals, artificial colors, preservatives or synthetic fertilizers! Super concentrated Body Cleanse Veterinary Natural Alcohol-FREE extract: dried plant/ solvents ratio is 1:3! 1 ml of our glycerite is approximately equal to 300 mg of dried plant. Body Cleanse Pet Herbal Supplement is 100% drug-free and non-addictive natural Glycerin based liquid formula proudly manufactured in the USA, Hawaii to ensure highest quality of the product! 1 ml is equal to about 25 drops. Each 2 oz bottle contains approximately 1500 drops, and each 4 oz bottle contains approximately 3000 drops of the formula! This Body Cleanse extract made from the Certified Organic or Wild Harvested Dried Burdock Root, Dandelion Root and Herb, Slippery Elm Bark, Yellow Dock Root, and Turkey Rhubarb. For Cats, use up to 0.25-0.5 ml 2-3x daily. Squirt directly into mouth or add to food or water. Strength: Dry plant material / solvents ratio 1:3. 1 ml of extract is equal to 300 mg of dried herbs. Safety information: Keep out of the reach of Children. This formula is not for use in pregnant or nursing females, animals with kidney or liver disease, or those with seizure disorders. Do not use this product before surgery. Do not use if seal is broken or missing. Store in a cool dry place. Refrigerate after opening. Legal disclaimer: We recommend that you consult with a qualified veterinarian before using this or any other herbal products. *Actual product packaging and materials may contain more and/or different information than that shown on our Web site. We recommend that you do not solely rely on the information presented and that you always read labels, warnings, and directions before using a product. Content on this site is for reference purposes and is not intended to substitute for advice given by a physician, pharmacist, veterinary, or other licensed health-care professional. You should not use this information as self-diagnosis or for treating a health problem or disease. Information and statements regarding dietary supplements have not been evaluated by the Food and Drug Administration and are not intended to diagnose, treat, cure, or prevent any disease or health condition. Please note: Actual color of extracts might be different from the photo illustrated! We do not accept returns on 2x32 oz, 15x4 oz, 64 oz and 2 gals options! I had a problem resulting from miscommunication between USPS & Amazon, but no problem with the seller or product. Very fast shipping, but thanks! Arrived well before anticipated date which was a bonus!! Item arrived well before the anticipated date which was a bonus!! It was one of 4 products recommended by my doctor for Lyme Disease I got from a Deer tick bite. The packaging was done well. I am happy with the product. I will use this seller again. Feels great on my face, so much less expensive than products containing small amount of Konjac. Holds moisture in the skin with the glycerine.. I will continue to use this source to purchase Milk Thistle. Excellent company. Will continue to order from them. Excellent service, and an excellent product. Thanks! Works like a charm for restless legs! Extract arrived 3 days sooner than expected, item packed very well....Very pleased with purchase! Arrived as estimated time frame. Thanks. Product arrives in time promised and is packaged well to prevent damage. Excellent. Thank you, very much. Simply the best horny goat weed. This item arrived fast & was exactly as described. I would not hesitate to order again from this great supplier.